Crude oil settled over $100 a barrel for the first time in a week after the U.S. Energy Department reported an unexpected decline in inventories. Gasoline, heating oil and ethanol also rose. Crude oil for June delivery rose $3.19, or 3.3 percent, to $100.10 a barrel on the New York Mercantile Exchange. The gain was the first in three days. Prices have slipped 12 percent this month and gained 44 percent in the past year. Inventories of crude oil declined for the second time in 11 weeks, falling 15,000 barrels to 370.31 million, the Energy Department reported. 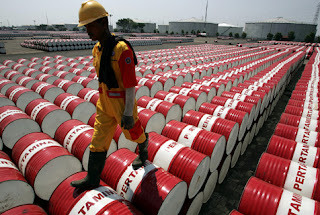 An increase of 1.7 million barrels was the median estimate of economists surveyed by Bloomberg. Days of supply declined to 26.2 from 26.3. Gasoline for June delivery increased 3.62 cents, or 1.2 percent, to $2.9555 a gallon on the Nymex. Gasoline has risen 45 percent in a year. Stockpiles rose for the second straight week after 11 consecutive declines, growing 119,000 barrels to 205.9 million. Demand increased 2.5 percent to 9.05 million barrels a day. Days of supply was unchanged at 22.9. Heating oil for June delivery rose 6.08 cents, or 2.1 percent, to $2.9059 a gallon. Heating oil has gained 48 percent in the past year. Distillate inventories fell for the sixth straight week, dropping 0.8 percent to 143.1 million barrels. Days of supply increased to 38.1 from the previous 37.2, a two-year low. Denatured ethanol for June delivery gained 6.4 cents, or 2.5 percent, to $2.648 a gallon on the Chicago Board of Trade. The fuel additive has increased 65 percent in the past year. BP Plc’s Texas City, Texas, refinery has returned to normal operations after the plant was shut following a power failure April 25, according to a person familiar with the operations.